I enjoyed reading this inspiring new book by a young British woman, Sarah Outen, who became the first female to row from Japan to Alaska in 2015. Outen’s book is compiled from journals she kept over her journey of 4.5 years, as she attempted to row, cycle and kayak 25,000 miles around the Northern Hemisphere. Outen’s expedition from London to London took her all around the world. While she accomplished this feat as a solo adventurer, she experienced great support and an outpouring of love and kindness from friends and strangers met along the way. The full title of the book is “Dare to Do: Taking on the Planet by Bike and Boat” (Nicholas Brealey, April 2017). The paperback book is available for purchase at Barnes & Noble and other booksellers for $19.95. For many of us armchair travelers, reading about the obstacles and challenges Outen overcame on an almost daily basis is incredible. The odds she fought in just getting her daring undertaking under way were overwhelming enough. Most of us would probably scoff at hearing a young woman say she meant to circle the globe entirely under her own steam. 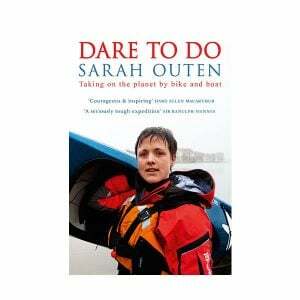 But Sarah Outen was determined. She would cycle, kayak, and row across Europe, Asia, the Pacific Ocean, the Americas, the Atlantic Ocean, and hope to eventually come back home to London. By the time we read that Outen has set off from Tower Bridge for France in her kayak, it has become obvious that she is no “ordinary” young woman. An experienced rower, Outen almost had to end her journey a year later. After a severe tropical storm in the Pacific Ocean, she had to be rescued from her broken boat. Her spirit was almost broken as well, but she picked herself back up and was eventually ready to try again. Although she had suffered from ill health and bouts of depression, she was determined not to give up. In 2015, Outen became the first woman to row the mid-Pacific from West to East. She kayaked the Aleutian chain before cycling across North America in the winter. She then set back out on the Atlantic to complete her long journey home. Along the way, Outen inspired many of the people she met to become more active, and to find more adventure in their own lives. Outen is also in demand as a motivational speaker and an ambassador and patron of a number of charities in the U.K.